See how exciting this looks?!?! So naturally, I preordered tickets from Fandango to go to our Marcus Theater for the first weekend that it opened. I didn't give my husband much of a choice, but we were both on the same page about seeing it. This is not a sponsored or endorsed review. All opinions are my own and I was not asked to write this. 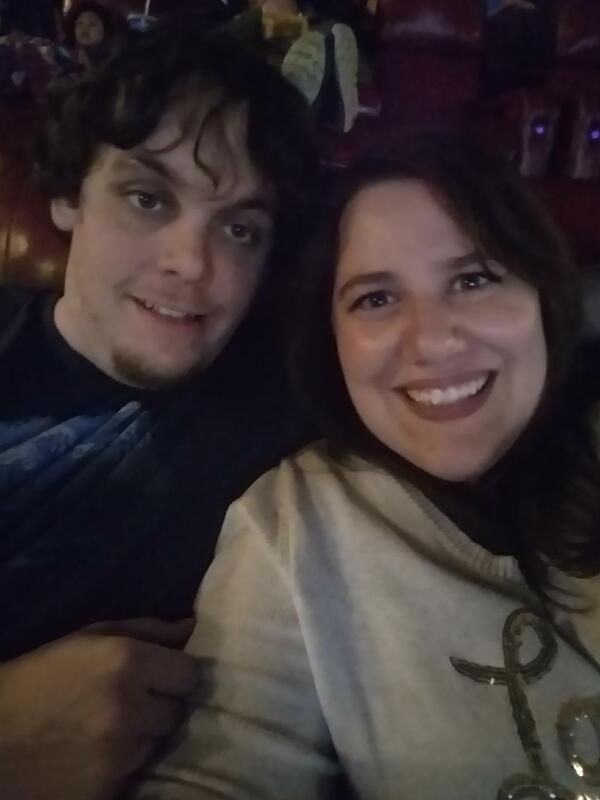 This post was written because I wanted to see the movie and let everyone know how awesome I thought it was. This post does contain Amazon Affiliate links which means that should you purchase from one of these ads or links, I may receive a small commission at no extra cost to you. 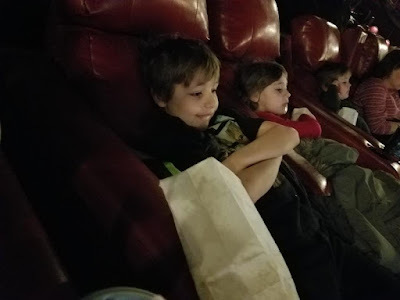 There was a little hesitation about bringing all three of our kids since they are 9, 7, and 4 (almost 5) because the second movie had had some scary moments and we knew that there was going to be a bad guy in this movie. We hadn't pre-screened it and didn't know if the kids would be too scared with no where to hide, but they were all just as excited to see it as well. If you haven't seen the first two movies, you should know that the series starts with a Viking boy named Hiccup who lives on the Island of Berk where dragons come to terrorize the island. Hiccup is kind of a scrawny little guy who gets in the way of the other vikings when they are trying to kill the dragons that keep attacking their Island. Hiccup, an inventor, wants to prove that he can be useful and kill dragons, even though he isn't strong or the most coordinated, so he invents this contraption and uses it to kill the most deadly dragon- the Night Fury. He ends up capturing the dragon and injures him, but he doesn't have the heart to kill him. From this one dragon, he is able to learn more about dragons and discovers that the dragons and vikings can actually live in peace and harmony and needs to convince his father of this. In the second movie, all the vikings on this island have their own pet dragon. Hiccups father (the chief) wants to leave the island to Hiccup one day, but Hiccup isn't ready for the responsibility. Instead, he explores the lands outside of Berk and discovers a long lost secret and also a man who wants to use all the dragons in the world to take it over. Hiccup and his gang have to figure a way to destroy the bad guy's secret weapon in order to keep their dragons and not be defeated. Which then brings us to the third movie. If you are an emotional person who cries during movies, you may want to bring some tissues. I used to laugh at my mom for crying while watching movies, and now I am just like her. Having kids has softened my heart and if I see anything that can tug at my heart, I'll get emotional and cry.... Which is what I did for probably a third of the movie. 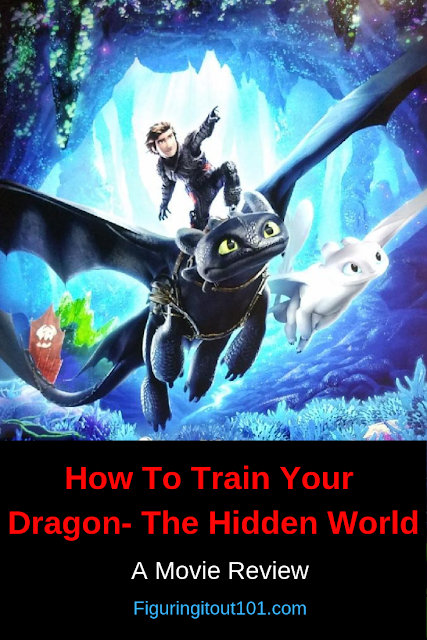 The hidden world starts off with Hiccup and his friends taking over a ship that had captured dragons. The way that the gang maneuvers and does their own thing outside of the original plan is comical and unless you have no sense of humor, you're going to laugh. In the end, the gang releases the dragons on board, but the crew that was left behind is furious and contacts the world's best dragon hunter to help them get revenge. This is the part that got really scary for my youngest and even I cringed a bit. Grimmel is this movie's villain. He is evil and conniving and a true hunter. Thankfully, Hiccup seems to be even smarter because he's able to keep a few steps ahead of Grimmel for the most of the movie. Grimmel has a long, gaunt, face with blondish white hair. He has learned how to train these dragon killer dragons by drugging them. These dragons spew poison and shoot fire from their mouths. These are definitely the most creepy dragons with their scorpion like shape and spider like fangs. 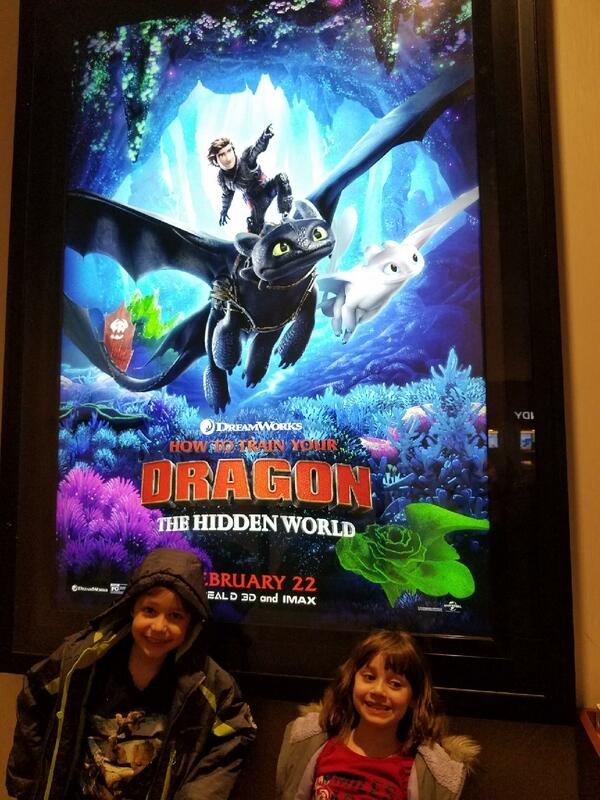 If you take your children to see this movie, I definitely recommend you see a matinee because these dragons can give them nightmares and they're going to want a distraction afterwards. Eret- one of the dragon hunters turned dragon lover from the second movie warns Hiccup of Grimmel. He tells him that Grimmel is the second best dragon hunter (Eret had been #1) and was ruthless. Hiccup shakes the warning off because they had Toothless and all of the other dragons and so he thought that they'd be unstoppable. In the meantime, Toothless- the cutest puppy/catlike dragon you've ever seen, begins to get restless. He senses that something is out in the wild and goes to track it down. He's discovered another kind of his species and she just so happens to be a beautiful Light Fury. Toothless is captivated and wants to win the light fury over, but he's been domesticated by the vikings that he's gone a little silly and has forgotten how to act like a dragon around a wild one. Unfortunately, the light fury gets spooked and flies off. Since Toothless can't fly without Hiccup (due to the injury his sustained in the first movie) he can't fly off with her. Toothless is in love and starts behaving like he's twitterpated and distracted, which is what Grimmel wants. Grimmel makes an attack on the village and Hiccup sees that the village is no longer safe and convinces the village to find a new home away from those who hate dragons. During this move, the light fury follows Toothless. Amidst a serious situation, we get some comic relief and get to witness the beginning of a new love story. It'll make you laugh, it'll make you cry, it'll make you cry giggle. I was very glad that it was dark in the theater because my eyes kept tearing up like a waterfall. I took these during the credits when the lights were still on. I'm not THAT person who takes pictures when the movie is going. During the movie, we see Hiccup struggle with thoughts of being incompetent and self doubts. Astrid, his fiance, is coached on how to be there for Hiccup because every great leader should have someone they trust on their side in order to help them see clearly what they cannot. 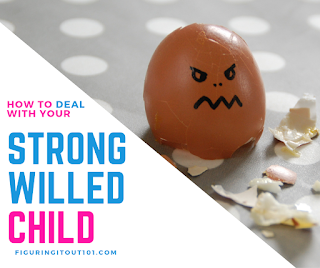 We witness a childish leader become a dependable man and it's awesome and heart warming, and really, you just need to watch the movie because I don't want to give away too much! I don't want to say too much more because I don't want to give away the whole movie. I really enjoyed this movie. There were a few spots in the beginning where they were reintroducing the characters that got a little slow, but other than that, the movie was easy to follow. If you have younger kids and you want to bring them, I'd really advise the matinee viewing. It does get pretty intense and the villain and more specifically, his dragons are scary. My four year old was plastered to grandma for the first half when we could see what the killer dragons could do. He was scared, but not scared enough that he wanted to walk over to me to snuggle or say, "Let's get out of here." However, he's almost 5 and he's getting used to watching some slightly scary things since he likes to watch some of the things his older brother watches. If you like cats and dogs, you'll really enjoy watching how the dragons interact with each other. The light fury has this cute little purr and everything about the nice dragons is either funny or adorable. If this were going to be the last installment of this series, I think they ended it well. I would give this movie a 4.5 out of 5 for a children's movie and a 5 out of 5 for adults who like animated films. I actually told my husband that I would like to watch it again the day after and when this movie comes to dvd, we will definitely be buying it. My kids ratings- "This movie was so good!" "We have to buy this!" When I asked each individual what their favorite part was, my oldest said, "I like the part where they battled on the ship! Both times!" My daughter- "I liked when we saw Toothless fall in love!" My youngest- "This wasn't How To Train Your Dragon, this was Toothless. I like the movie with Toothless in it." When I asked if he'd watch it again, he said, "Let's buy the movie, now." He was a little upset when I told him that it would probably be a few months before we could buy it. Have you seen the movie, yet? Do you love these movies, too? By the way, we updated the look to our site. Do you hate it? Love it? Should I bring back the old look? This is not an endorsed or sponsored post. This is a movie that I really wanted to see and wanted to write a review for. All opinions are my own and was not asked to write this. This post does, however, contain Amazon Affiliate links which means that should you purchase from one of them, I may receive a small commission at no extra cost to you. i didn't even know there was a movie. i'm guessing my niece will def want to go see it! It was really good! If I didn't see the trailers on Facebook, I don't know if I would have known about it either. I love the two previous movies under this title! I did not even know that they came up with a new one! I would love to see this! I saw this movie and it was good. The hidden world was so pretty. My son was able to watched this movie with his uncle last weekend and he did mention that it was really good. I don’t want to share what my son told me to avoid any spoilers haha. I loved the second one, but I really loved this one! Omg. I saw this move the first day it was released. And I loved it! I'm glad you had a great time! I would have seen it sooner if I could. I think I was more excited than my kids. It's my sister's favorite movie, she has been able to see the real message and let me appreciate it and love it! I don't think I ever heard about this movie. Since you are giving it a 5 out of 5 for adults then I need to let my daughter know about it and ask for her feedback. 5 out of 5 for those who like animation films. Rotten Tomatoes had it at a 98%. I haven't seen the movies yet. My son has been asking to see this though. Thank you for the review because it helps me determine if he's ready for the emotional complexities or the scary parts yet. It's one that grows on you. I haven't seen it yet, i can't can't can't wait. I love animations. Thanks for sharing. I hoe you live it when you do! 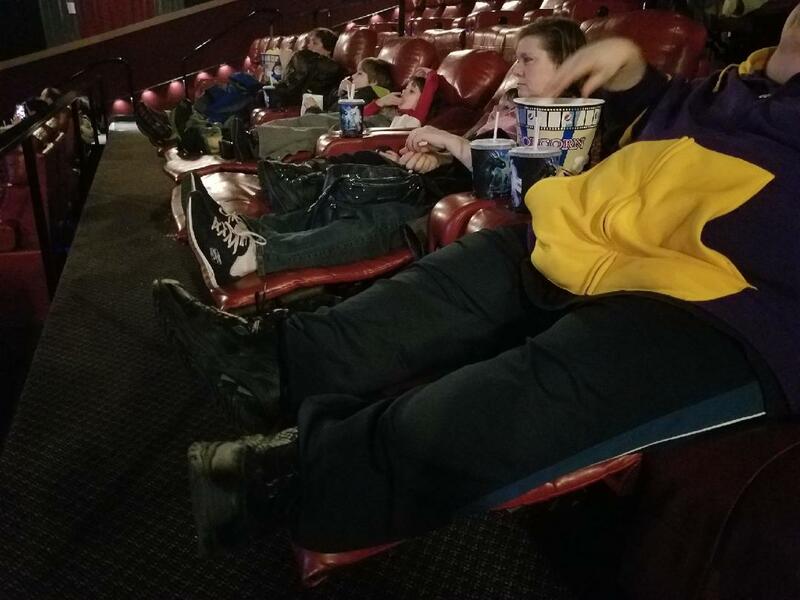 My friend saw it and he said he wasn't expecting half the theater to be filled with crying kids. I can't wait to go! Oh no! I hope the experience is better for you! I've only seen the first movie, but I do remember loving it. I think this sounds like a great show to take the kids to as long as you know the parts where they might get scared or upset. My 7 year old seemed to be ok with the scarier things but my almost 5 year old had trouble. This is a great review! Thank you- I was debating taking my 6yo, I think we’ll defin take him this weekend! Thanks for the review! I didn't realize they were making a third movie! It sounds like an adorable animated film. So glad to hear your family enjoyed it! I haven't gotten to take the kids to this yet! It looks so good, I can't wait! My small brothers love the animation of the movie- How to Train your dragon. They even had to get it for their laptop. That's so cool! I'm glad they like it! I only saw the first one but really enjoyed it. I feel like I should really look at the others, it is alot of fun. I looked the first one, alright, but the second movie really drew me in. They did a really great job ending it! I hope you enjoy it! My bro-in-law took my nephew to see the Lego Movie first and then my nephew saw HTTYD3 a couple days laret. I saw this movie and I really enjoyed it. Its lot of fun and thanks for sharing.